The heat and massage functions found on some models of inversion table are not always the best. In fact on certain models that feature heat and vibrate settings, the main reason for poor reviews and ratings is due to the heat and massage function. Common complaints often state that the massage functions are quite weak and ineffective. While others complain that the heat and massage functions are unreliable or simply stop working after a few sessions. Luckily, not all inversion tables that feature heat and massage functions are terrible. As you will see below, there are some really good ones to choose from. It is worth pointing out however, that you should not expect too much from the massage functions on an inversion table. Most tables will simply feature a vibration massage function. If you are expecting a massage chair style experience from these inversion tables you will likely be disappointed. Are Heat and/or Massage functions really necessary? It is said that heat and massage pads may help with blood circulation and help decrease stress. It is also said that these functions may help relax muscles and help them recover faster. However whether you choose an inversion table with these features really comes down to what your individual preference is. Many will find they can live without these features, and you will often find a few buyer reviews stating that the individual stopped using the heat and massage functions after a few sessions. This is perhaps maybe due to the hassle of plugging in the device and having to wait for heating elements to warm up. On the other hand some buyers feel the heat and massage functions are the best thing about the table they use. They feel the heat and massage features really helps with relaxation and loosening up the muscles. Some even state that after using an inversion table with heat and massage features they would not go back to using a table that didn’t have these functions. Depending on how busy your lifestyle is, an inversion table with heat functions may not be ideal for you. Some heating elements can take up to 15 minutes to heat up. Therefore if you are a very busy person, it may be frustrating waiting for the heating elements to warm up and you will likely end up not bothering with the feature at all. With this in mind, in the list below you will find inversion tables that are very good choices regardless of the heat and/or massage functions. So, if you do decide after a few sessions that the heat function is actually more hassle than it is worth, you will still own a very good inversion table overall. The Ironman IFT 4000 does not feature massage vibrate functions, however it does have an infrared heat technology backrest. It is also a very good inversion table to consider whether you are interested in the heated backrest or not! The thick padded backrest and 350 lbs weight capacity are just a couple of other reasons why this inversion table is a very good choice. The Ironman 4000 is one of the most popular heated inversion tables currently available, it is also however one of the most expensive options on this list. 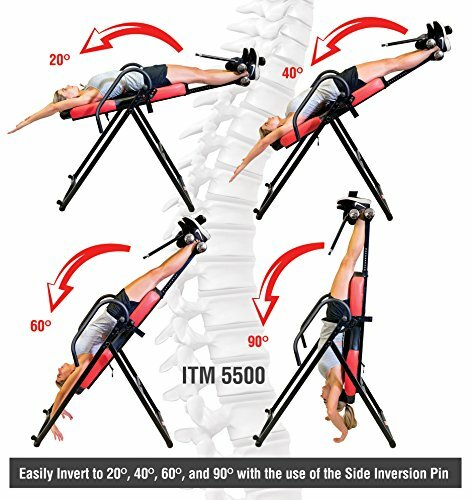 The heat function on most inversion tables is usually the best feature, but the Ironman IFT 4000 inversion table actually has a number of very good features. The Ironman 4000 has a very large padded backrest, which along with the 350 lbs maximum weight capacity makes it a very suitable choice for larger and wider users. The backrest is also 2.5 inches thick with padding, so even without the heating element enabled it is a very comfortable inversion table. Other stand out features include the extra long palm activated ankle lock lever. This is a feature that is becoming more common on inversion tables, as it removes the need to bend down when securing yourself into the ankle holders on the inversion table. Another nice feature is the inverting stretch and stabilization hand grips on the lower back bar of the table. The infrared heat therapy function can be controlled by using the LED display or via the remote control. You can adjust the duration of the heating process and adjust the temperature between 90 and 140 degrees Fahrenheit. Is the Ironman IFT 4000 the best inversion table with a heat function? 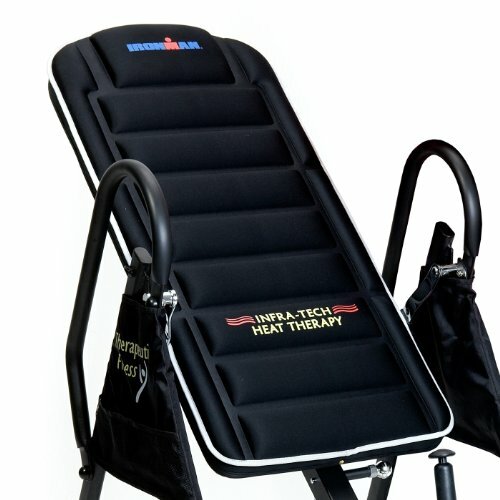 It is hard to say if the Ironman 4000 is the best heat therapy inversion table, however it is certainly close. The additional features alone, make this a very good inversion table to consider and the heat function really is a great bonus. The buyer reviews and ratings for this particular inversion table are very good and many love not only the heating function, but also the table as a whole. As is mentioned earlier in the page, heating components can be a little unreliable and therefore there are a few complaints of the heating element failing. These complaints luckily are quite minimal but to be completely satisfied be sure to have a look at the reviews on the product page. Overall if you require a strong and sturdy inversion table that has a very good and effective heat function, the Ironman 4000 is an excellent choice! Many love everything about this very well made, stable and comfortable inversion table from Ironman. The Innova ITM-5900 inversion table is one of the lowest price inversion tables to feature heat and massage functions. The ITM-5900 is also one of the best inversion tables to consider from the Innova range and has the most added extras in terms of features. 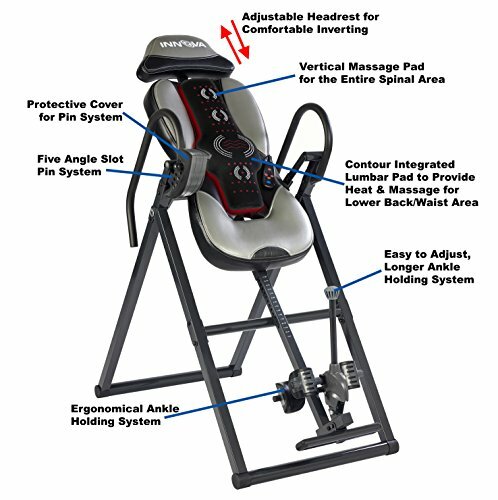 This inversion table is loved by many who buy it and the buyer ratings are incredibly high. There is also very little negativity where this inversion table is concerned, many are more than satisfied with the good quality of the table and the excellent heat and massage pad. 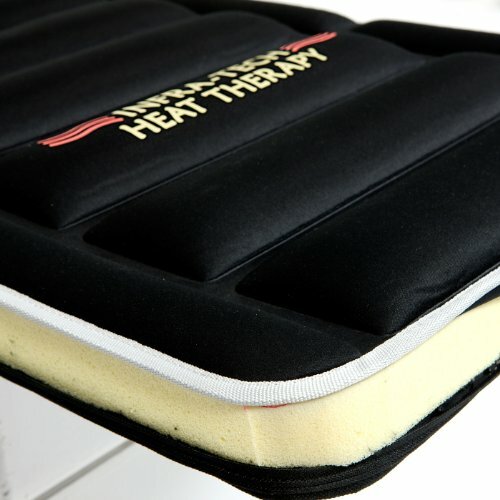 The advanced heat and vibrate massage pad runs through the middle of the inversion tables well padded backboard. This allows you to apply vibration massage across the whole of the spinal area. The pad also features a rounded contoured lumbar support area, that has an inbuilt heat and vibrate function that focuses on the lower regions of the back. Using the included wired remote control you can adjust the heat and vibrate massage functions while using the inversion table. Using either manual settings or one of the pre-programmed settings. The massage and heat pad runs off the mains and has a fairly long 8 foot long cord. The pad can also be removed should you prefer not to use it during some inversion therapy sessions. 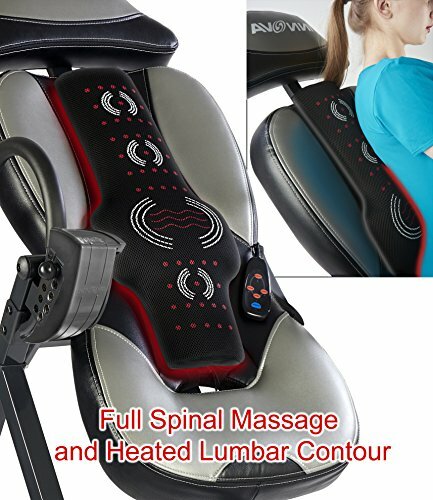 In addition to the heat and massage pad the Innova 5900 has some other great features such as the adjustable headrest and the extra long ankle lever. The slot pin inversion angle limitation device on Innova inversion tables is also a nice touch and an easy to use alternative to the standard tether strap systems..
Is the Innova ITM5900 inversion table a good choice? Simply by looking at the buyer reviews (featured on the product page linked below) it is clear to see that this is certainly one of the best options if you are looking for a heat and massage inversion table. In addition to the excellent ratings, it is also one of the few inversion tables to feature a heat and massage pad where there appears to be no negativity towards this feature. It is quite common to see users complain about the heat and massage pads on other models, however everyone seems to love the pad on this model. With many stating how effective and good the heat and vibrate functions are. Based on the price and features, it is probably fair to say that this inversion table is as good of an option as the Ironman table listed above. Therefore it mainly comes down to your own personal preference as to which model you choose. Much like the Ironman 4000, even if the Innova ITM5900 didn’t have the heat and massage function is a very good inversion table overall. The only real reason to opt for the Ironman IFT 4000 over this model would be due to the slightly higher 350 lbs weight capacity. This Innova table also features vibrate massage functions, whereas the Ironman IFT 4000 only has heating elements. The difference in cost is also quite significant, with this Innova model being the best option in terms of price. There are a few other options which could have been added as the 3rd best choice of heat and massage inversion table. 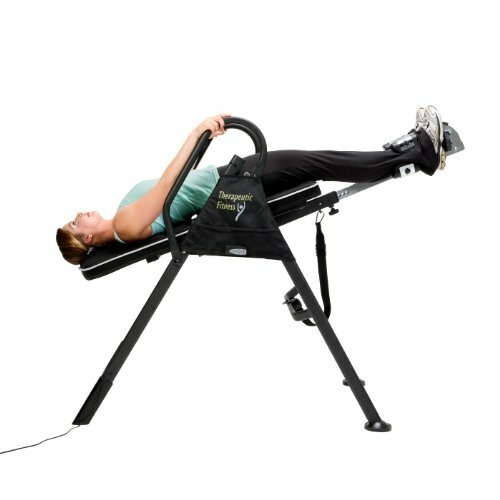 However in our opinion this Health Gear inversion table is the 3rd best overall, mainly due to other great features it has. It has a very nice look and has been designed in a racing seat style, it is also very well priced and one of the cheaper heat therapy inversion tables on the market. On the whole, buyer reviews are very positive and the negative reviews for this inversion table tend to be due to packaging issues rather than the table itself. The 4 inch memory-style foam backrest is a real highlight on this inversion table as is the removable/optional heat and vibrate massage pad. The massage vibration and heat pad can be adjusted using the wired remote control while the table is in use. Also since the pad is removable you can take it off the table to use on a sofa or a bed. The pad is electrically powered and needs to be plugged into the mains to operate. 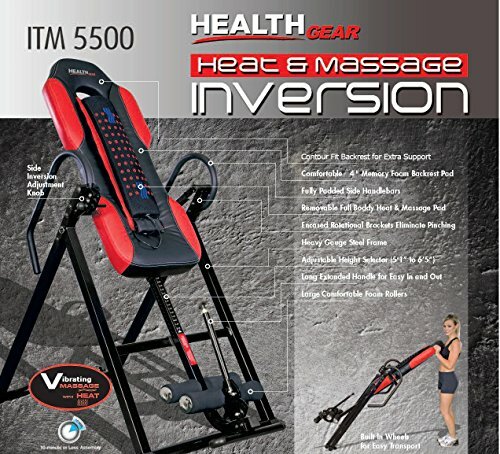 Just like the other two inversion tables listed on this page the Health Gear ITM5500 is a very good inversion table to use even without the heat and vibrate pad. The extra long ankle lock lever and the angle pin limitation system are very good additional features. As are the comfortable dual foam ankle holders and the useful raised lower stretch bar on the rear of the tables frame. 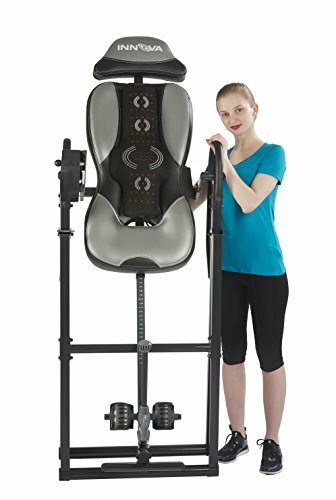 Is the Health Gear ITM5500 inversion table a worthwhile investment? The ITM 5500 from Health Gear is one of the best inversion tables with heat and massage functions, however the other two inversion tables listed above are perhaps better options overall. While the buyer reviews are mainly all very positive, there are a few complaints here and there. One problem that stands out a little, is due to the positioning of the bar on the front of the frame. Due to the location of the bar the inversion table does not go fully to 90 degree (complete inversion). As you can see in the image to the right, it is slightly less than 90 degrees. Although this may not be a problem for some. It is also worth pointing out that the massage function is more of a relieving vibrate function. 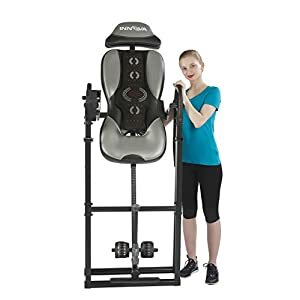 It has already been mentioned in this guide that this is pretty standard for inversion tables, and you are unlikely to find a table with similar massage capabilities to a massage chair. Hence the huge differences in price between inversion tables and massage chairs. Despite this many who use the massage and heat pad on this inversion table feel it is a nice addition to add some soothing stimulation while inverted. The low price of the Health Gear ITM5500 is also very appealing. If you are looking for a low priced inversion table with heat and massage functions, this model or the Innova ITM5900 (listed above) are most probably the best options available at present. Both products are fairly similar in specifications, features and price, however in our opinion the Innova model has a slightly better heat and vibrate pad which also has a lumbar support area built in.